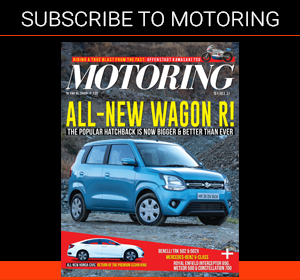 Is ‘everyday supercar’ a misnomer? 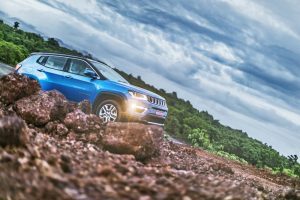 It’s certainly something every car manufacturer wants to have in its portfolio, but not all of them get it right. Especially when everyday conditions are of the Indian kind — traffic, too much attention, unruly animals and jaywalkers, perennial ‘texters’, etc. On the other hand, it ought to do justice to its racing pedigree. Which the car in question, the Audi R8 V10 Plus, wasn’t any short of. Would it prove to be the best use of the words ‘everyday’ and ‘supercar’ together? Fret not, we were to find exactly that. 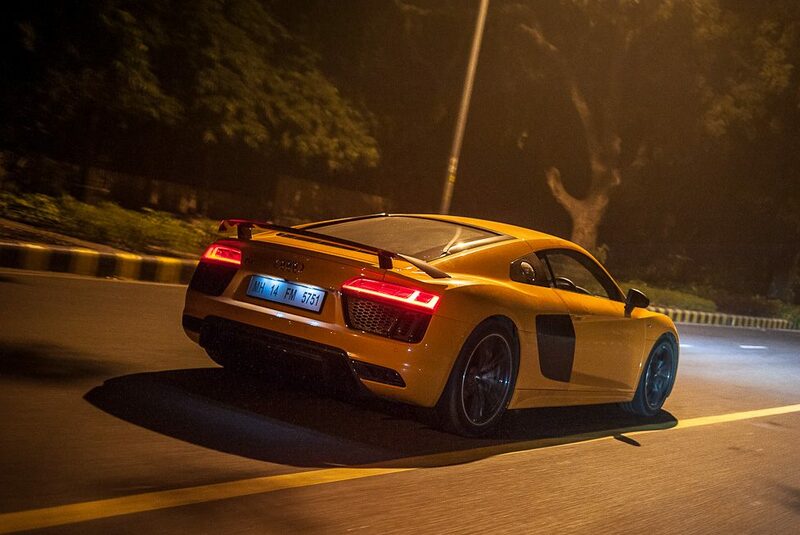 Out on the Buddh International Circuit, the R8 comes alive, not only on the straights but also in corners. The R8 is surprisingly easy to drive, hugely rewarding when you get it right, and one of the best ways to spend your track days in. It has a powerful engine placed in what’s possibly the best arrangement (read mid ship) for a driver-orientated car, and it just sings. After being away with the fairies for almost a second there, you begin to notice finer details about the R8. 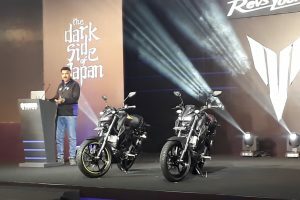 Like the steering, for instance, is light at low speeds, but inspires confidence, without asking too much from your biceps. Even when you’re pushing it, the car is aware of your less than perfect driving abilities, hence keeps it all nice and steady. It eventually rewards wholeheartedly when you get it right, and lets you have fun, but not at the price of overall stability. On the straights it darts like most other powerful Audis, making the kind of progress synonymous with race-cars, courtesy of its 602 bhp engine. 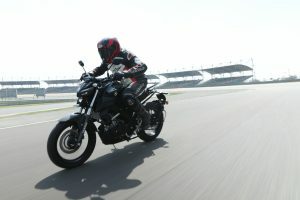 It turns in nicely, wherever you point its front wheels at, and doesn’t bother too much if you open throttle mid-corner. Corner exits are generally taken faster than expected, and as you sense understeer building up in longer, sweeping sections, the quattro sends more power to the rear wheels, hence keeping the car stay neutral in its poise. To ensure it handles the well-laden tarmac of Delhi, the R8 was switched to ‘comfort’ mode, my seat height slightly increased, and the Bang and Olufsen system connected to FLAC playback — well, when the car is so pure with its feedback, why mustn’t be your music! Like on most cars with low ride height, the speed bumps need to be tackled at an angle, and the oncoming (but unavoidable) three-hour long traffic jam with God-like patience. Moving forth by half a centimetre every minute, the R8 kept its cool — literally, with the temperature gauge never heading for the hot mark. 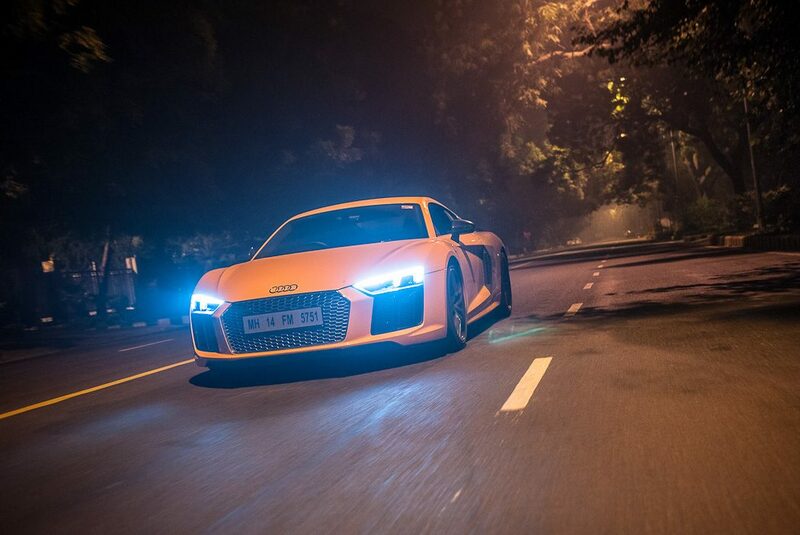 Crawling in the first two gears, making its way through traffic, the R8 felt extremely docile. Of course, it’s not the kind of approach you would have with a supercar, but this certainly is as much ‘everyday’ as it gets. 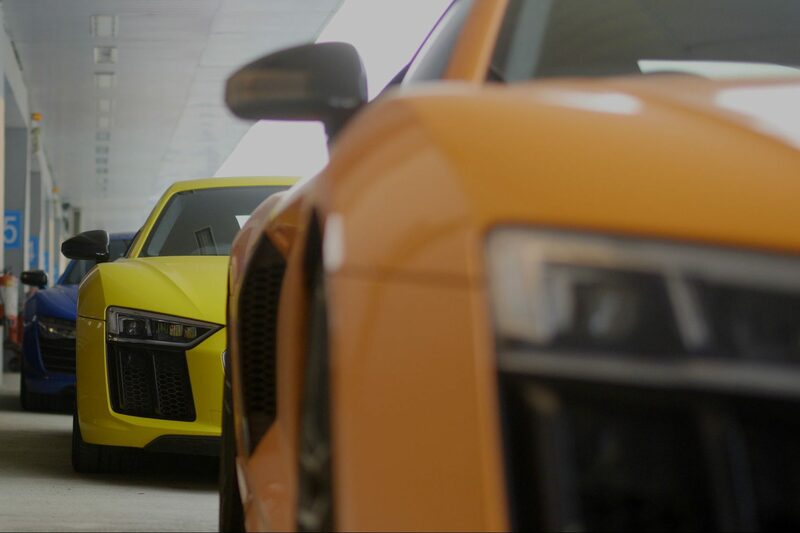 It’s a centre of attraction, the Audi R8. It grabs eyeballs faster than Cara Delevingne’s recent cover on Esquire, has little guys and girls giggling just at the sight of a car that looks and goes equally fast, and has others nodding in appreciation. That’s easily the maximum attention one could get without doing anything illegal, outrageous, or both. Once out of the cabin, you would notice that the design, which is certainly more of an evolution of whatever Audi has done, has the classic appeal of the R8 but is sharper and makes the old car look dull in comparison. The details don’t go unnoticed on the car, either, especially how under a street lamp, the ‘V10 TFSI’ on the engine reflects off the engine cover in the rear-view mirror. It’s the most satisfying sight in this car, for it represents the powerful, mid-mounted 5.2-litre V10 engine which is so instrumental in making the R8 V10 Plus such an exciting car. And every moment spent in its presence is an event. An event to cherish, an event you’re likely to long for (unless you’ve the R8, that is), the kind of automotive satiation that only a few cars, modern ones less so, can provide. Even at pedestrian speeds. And as the lit street lamps become fewer, the Audi one again clambers new heights of desirability. Its harmonious noise (both induction and exhaust; the former’s a bit more pronounced) resonates off the buildings, its headlamps light up the roads ahead like the sun hadn’t set, and it sticks to the road even while raking a blistering pace. It soaks in mild bumps with ease, and while the low seating position might take some time getting used to, once inside, it’s every bit as comfortable as a sportcar should be; just that it’s more capable than a sportscar. A few days later, on my way back home, as we descended (I am a nervous flyer!) and the horizontal G-forces started working on to pull me away from the cheap airline seat (relative to the very supportive racing ones of the R8), I closed my eyes to re-experience the R8’s super-efficient braking on the back straight of the BIC. A distant voice asked me to disembark, but all I could hear was myself asking for another lap of the circuit. Or maybe in the city. Because the R8 was equally good in both.